All that’s needed, the Republican candidates say, is to resurrect Reagan policies and today’s U.S. problems will be solved. “Vote for me, and I’ll return to Reagan and restore U.S. greatness,” we’re told. With the Democrats, it’s a bit more subtle but the underlying message is the same. Under Hillary’s hubby, Bill Clinton in the 1990s, the U.S. created a record number of jobs, incomes were rising, the healthcare crisis was contained, and the U.S. had achieved a “new economy” of prosperity that would only improve further in the 21st century. Under Bill, we were on the right track. George W. Bush screwed it up by reversing course. All we need then is to get back to that “Clinton track” and good times will return again. But what are the facts? Were Clinton policies a diversion from Reagan? A continuation? Worse? During Bill Clinton’s two terms in office, 1992-2000, 45 percent of all the income growth during the period went to the wealthiest 1 percent of families in the US, according to IRS data gathered by economist, Emmanuel Saez, of the University of California, Berkeley. The S&P 500 stock index rose 234 percent, providing the wealthiest 1 percent households most of that 45 percent gain. 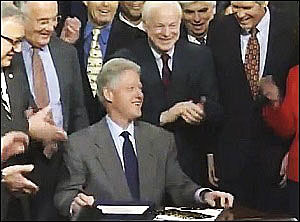 Bill’s big tax cut handout to the 1 percent enabled that income growth by reducing capital gains taxation in 1997 from 28 percent to 20 percent. Executives’ direct pay also rose — on average from US$4.5 million in 1992 to US$11.1 million by 2000, for a 342 percent increase. CEO pay was equal to about 90 times the pay of the averaged paid worker; by the end of his second term, CEO pay had risen to more than 300 times the average worker’s pay. How did the average worker do over the same period? Adjusted for inflation, in 1982 real dollars, average hourly pay rose by a paltry 5.8 percent over eight years. At the bottom of the work force, the minimum wage, measured in real terms, rose by a mere 4 cents an hour to US$5.50. The 5.8 percent and 4 cents an hour were more than offset by workers’ rising contributions to continue their pensions and healthcare insurance coverages. Apart from reducing capital gains taxes for wealthy stock and bond owners, Clinton exempted the top 10 percent households from tax hikes in 1993. Thereafter, in his big tax cut act of 1997, he raised the threshold for paying any estate tax, cut gift taxes (so the rich could give more to relatives), repealed the alternative minimum tax for small businesses and reduced it for larger corporations. Meanwhile, the effective corporate tax rate — i.e. the rate at which they actually paid a percent of their profits — fell from 18 percent in 1995 to 12 percent. In his second term, 1996-2000, no fewer than 63 percent of all corporations in the U.S. paid no corporate income tax whatsoever, amounting to a US$2.5 trillion tax windfall. Income inequality trends, topical in the U.S. and the current 2016 presidential campaign today, actually accelerated under Clinton, and even more than under Reagan. OK, so the rich got significantly richer on Bill Clinton’s watch. But at least U.S. workers were able to enjoy significant job creation, according to the Clinton camp. Hillary and Democrats like to talk a lot about the jobs created in Bill’s second term. Admittedly, jobs were created, but they were mostly in low pay service occupations. Meanwhile, higher paid manufacturing jobs were being lost in the millions as a result of Bill Clinton free trade policies alone. Clinton proved an even fiercer “free trader” than Reagan. In 1993, he rammed through Congress legislation to expand the North American Free Trade Agreement (NAFTA) to include Mexico. One million, higher paid U.S. manufacturing jobs were lost due to NAFTA on Clinton’s watch, another 880,000 lost to China due to Clinton giving that country what is called “preferred nation trading rights” (PNTR), and another 1.2 million due to the U.S.’s exploding trade deficit in general — according to research by the Economic Policy Institute in the U.S. Corroborating the Institute, the U.S. Commerce Dept. in the 1990s estimated that 13,000 jobs are lost for every US$1 billion trade deficit — and that trade deficit rose from US$118 billion in 1993 to US$436 billion by 2000 under Bill Clinton. Another problem with jobs during Bill’s term in office was the rise in what is called ‘contingent’ jobs, which means part time, temp, contracting, and other “alternative” forms of employment that typically pay 60 percent of full time regular jobs and very few benefits. Considering just part time and temp agency jobs, such low paid, tentative employment rose from about 22 million in 1995 to 27 million by 2000. In other words, when and if jobs were created on Bill’s watch, they were often low paid contingent jobs. Then there’s health care. The Clintons like to brag about how Hillary’s 1995 reforms, called “managed health care” (MHC), were successful in keeping healthcare costs down. Health care spending cost increase slowed a little in the 1990s. Instead of a 400 percent increase, as during the 1980s, health spending rose by only 60 percent from 1990 to 2000. However, that slower rate of increase was likely because the percent of corporations providing health insurance declined from 63 percent to 45 percent. Obviously, with 18 percent fewer companies offering health insurance, without coverage many workers had no choice but to forego spending on health care. The U.S. Census population survey shows that 31 million citizens lacked any health insurance in 1987. By 1998, this had grown to 44 million — a total which was then “redefined” by Clinton thereafter and reduced to “only” 39 million uninsured by 1999. Retirement benefits fared no better under Clinton. True pension plans, called Defined Benefit Plans, which guarantee retirement payments, were abandoned by the tens of thousands by companies in the 1990s. They were replaced by pseudo pensions called “401k” plans, under which workers may lose every penny of their contributions. As companies dropped defined benefit for 401k plans, enrollment in 401ks rose from 18 to 42 million workers . In addition, Clinton also allowed corporations to declare “pension contribution holidays,” during which they need make no mandatory contributions to their pension funds. Another Clinton move was to allow corporations to withdraw cash from their pension funds to cover 20 percent of their, the corporations’ share of the cost of health care insurance. The Clinton campaign’s frequent claims today that Bill’s two terms in office were days of exceptional economic good times for U.S. workers is just plain false. On several policy fronts, Bill Clinton was actually worse than Reagan — especially with regard to free trade and benefits like health care and pensions. At best, Bill Clinton’s presidency and legacy therefore represents a continuation of Reagan’s — not a shift from his predecessor. We shouldn’t expect anything less from Hillary — i.e. her continuation of Obama’s economic policies, which have brought very little benefit to U.S. workers while providing massive income shifts even more generous to the wealthiest 1 percent and their corporations. During Bill Clinton’s term in office, 45% of all the income gains went to the wealthiest 1%. But under Barack Obama, 97% of all income gains went to the wealthiest 1%, according to IRS data. And Hillary says she wants to continue BO’s work as well as Bill’s. Reagan, the Bushes, the Clintons, Obama–they’re all representatives of the two wings of the Corporate Party of America–aka Republicans and Democrats. Time to end the one party system in the USA don’t you think? Jack Rasmus is author of the recently released book, “Systemic Fragility in the Global Economy,” Clarity Press, January 2016, which is available on Amazon, in bookstores, and from the publisher, Clarity Press.